Flower pots often has drain holes in the bottom of them to allow for too much watering to drain out the bottom. The trouble is that the potting soil you add to these pots also drains out as you are filling the pot with new potting soil. 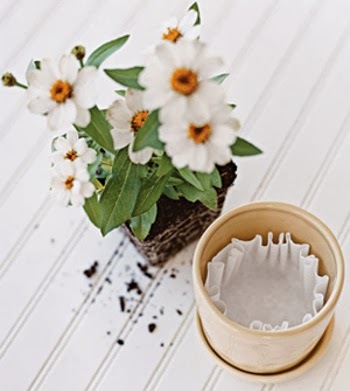 Just lay a coffee filter in the bottom of the pot covering the hole before filling the pot. The soil will stay in the pot and the water will still drain out because that is what coffee filters are designed to do; let water through. They last for a long time, too; by the time they fall apart, the potting soil is well packed and the plant has roots that hold the soil together.